The tech media has spent the vast majority of the last week focused on Google’s newest product, an ambitious platform called Google+ that the company hopes will break through their dry spell in the social arena and make them competitive. It’s early days — for many people it’s next to impossible to even get in — but things are looking positive. The app has been met by a largely positive reception and my stream shows no sign of slowing down as users keep posting after the novelty wears off. Circles is a foundational feature of Google+, and it’s what makes it so different from other social networks — and bridges the gaps between them. With Circles, you control who you share what information with, making mutual relationships where intimate information can be shared, Facebook-style, a possibility, while still allowing the unidirectional model of Twitter that allows you to follow people you find interesting without them having to follow you back. The interface for organizing your Circles is pretty cool too, but I don’t think it’s the animations that’s blowing people away. If I want to make a post that is viewable only by my family members, I can. If I want something to be viewable by the public, that’s possible too. There are no “all or nothing” scenarios here as there are with Facebook. This means Google can perform the roles of both Twitter and Facebook and puts it in a very powerful position. 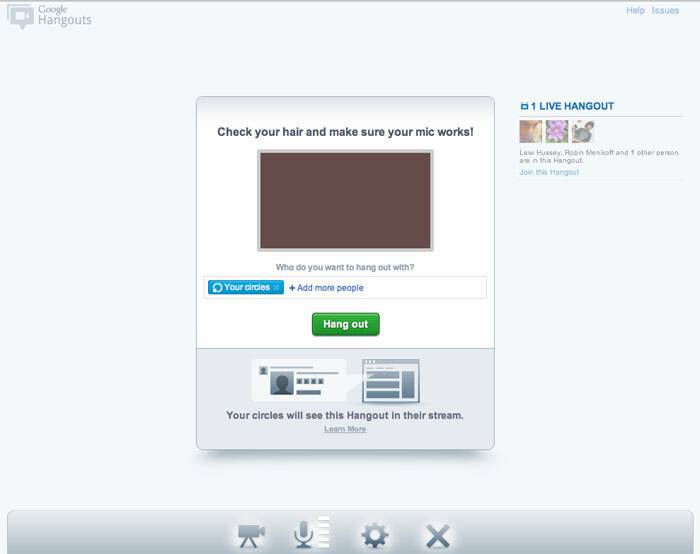 The stream is where you can view incoming information. It’s much like the Facebook news feed or your Twitter stream, but Circles gives you control over what you’re looking at here — it’s not just for deciding who to share content with. In the screenshot below I’m viewing content that has been shared by people I know from my role at The Next Web. I can easily jump between Friends, Family, Acquaintances, or the Following Circle that’s like a bucket for interesting people I’ve never met. As is the de facto standard today, the stream updates in real-time. There are some issues that Google engineers are actively working to fix — old posts tend to float to the top more easily than on other networks. 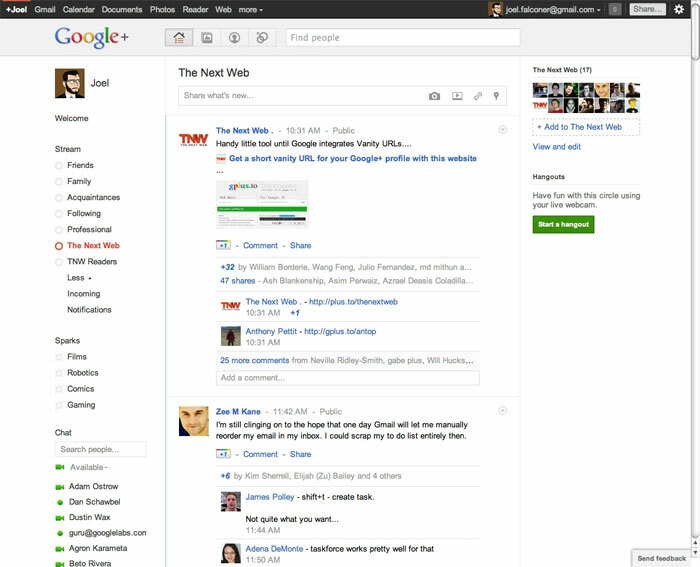 The Google+ stream is the equivalent of your Facebook news feed. 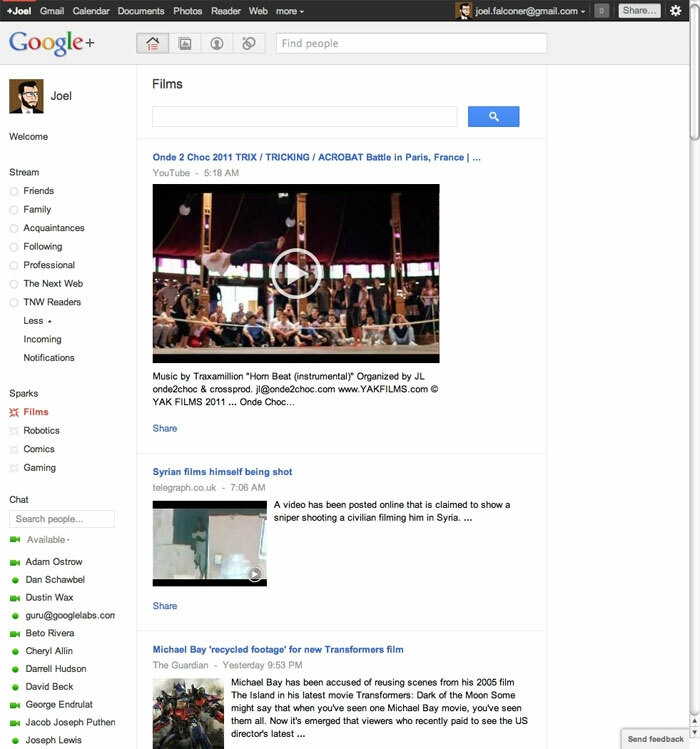 Sparks is billed as one of the main features of Google+ but doesn’t get as much airtime at the moment. That’s because it’s one of the few areas where Google seems to have not invested much effort into creating something truly useful. Sparks are feeds of information based on defined topics, but if you take a look in the screenshot below where I’m looking at the pre-defined Spark called “Films” there’s no curation to the content. The second result has something to do with a sniper shooting a civilian who wasÂ filmingÂ him in Syria — tragic, but not exactly what I’m thinking of when I want information about recent films. This feature could be a lot better. It could make discovering and subsequently sharing interesting information a breeze, but not until the results are much better. This would be a perfect place for some sort of integration with Google Reader, where the content has already been curated by both publishers and subscribers. Hangouts is one of the most impressive parts of Google+. The underlying technology isn’t that incredible — we’ve had Skype video conferencing for years. But Hangouts can handle ten or twenty people at a time without problems, and more importantly, it’s not the technology but the execution that makes this feature impressive. Video calls need to be arranged and specific people need to be called in, but with Hangouts, anyone from selected Circles can drop in and out. It’s an evolving social space like your local bar, not a rigid call structure, and that distinction is important. It makes Hangouts pretty revolutionary. You’re given a chance to fix your hair before you enter a Hangout. No doubt you’re wondering: when’s the API coming? Google says it will be here soon, and if they’re telling the truth they’ll have introduced an API much faster than Facebook did. 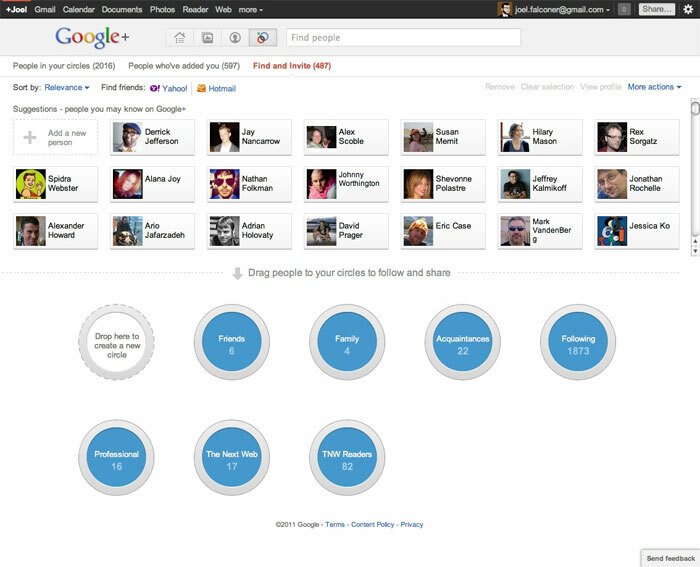 It’ll be interesting to see what sort of apps come out of Google+ that weren’t possible using other social platforms. There have been clues that Google+ Games is coming, and rumors that there’s a partnership with social gaming giant Zynga involved. Will Google+ be the next platform for casual game developers to tackle? We’ll have to wait and see, but I’m leaving at the first hint of Farmville spam.